The NFPA 20 fire fighting controller accepts digital status information from pressure or level switches. It accepts analog 4-20mA or 0-10V analog signal as well. 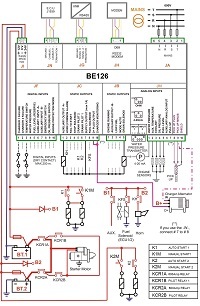 You can connect resistive sensors to monitor the engine parameters if CANbus is not available. It features RS232 and RS485 serial interfaces. You can connect the NFPA 20 fire fighting controller to the Internet. The Be126 fire fighting controller displays voltage and current of the batteries when you connect MOD-BUS battery chargers. The Be126 monitors the Mains. You can use the Be126 controller in standard diesel engine pump water station by enabling the ‘Engine Protection Mode’. The NFPA 20 fire fighting controller is designed to control and monitor 12 or 24 volt, diesel fire pump engine. It features state-of-art multiprocessor structure providing embedded water pressure data logger. The NFPA 202 fire fighting controller interfaces with standard or SAE J1939 compatible diesel engines and monitors, displays and records all engine information. The Be126 controller automatically starts the diesel engine from water pressure control or non-automatically from manual electric control. It initiates a weekly program test of the system and records analog water pressure measurements.